Please check back soon to purchase this item. 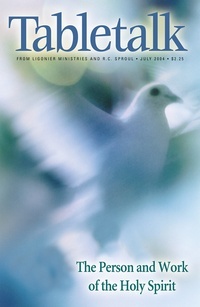 The July 2004 issue of Tabletalk studies the person and work of the Holy Spirit. Contributors include R.C. Sproul along with Larry Edison, Sinclair Ferguson, George Grant, O. Palmer Robertson, R.C. Sproul Jr., and Derek Thomas. Tabletalk features articles about topics central to the Christian faith and daily, in-depth Bible studies. The 2004 Bible studies take a careful look at the book of Hebrews, where the superiority of Jesus Christ is examined. I treasure Tabletalk. Many times the articles and devotionals enriched my thoughts and my preaching and teaching. Tabletalk's contributors are outstanding communicators, expressing complex theological thoughts in understandable ways. I treasure Tabletalk so much, I save every issue; my collection goes back to 1996. Thank you for an excellent magazine.